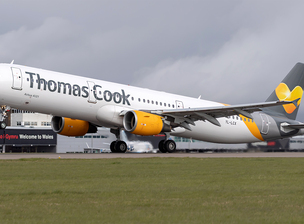 One of the UK's leading charter and leisure airlines, Thomas Cook Airlines has introduced an A321 aircraft at Cardiff Airport, replacing the existing A320 aircraft and marked the earlier start to its summer season with the launch of flights to Enfidha, Tunisia. Cardiff Airport is the national airport for Wales and a key gateway to the UK, welcoming over 1.58 million passengers annually. 18 airlines currently operate at Cardiff Airport, with over 50 direct routes available and a further 900+ connecting destinations accessible via key hub airports. Cardiff Airport is a key contributor to the local economy, supporting 1,900 aviation-related jobs and driving over £163m of direct economic benefit to the region. Thomas Cook basing the larger A321 at the airport means that over 170,000 seats are now on sale from Cardiff, a 25% increase on capacity from the airport in 2018. With 11 flights a week from Cardiff in the spring, increasing to 14 in the summer, Thomas Cook Airlines fly to ten destinations from Cardiff including Turkey, Tunisia, Majorca, Tenerife, Cyprus and Greece. Seats are now on sale for 2019 as well as Summer 2020.